I apologize for any incoherency in this post. I wrote it while watching Epic Read's Tea Time as a headache grew between my eyes, blurring my vision. Normally I'm a little more comprehensible then this. 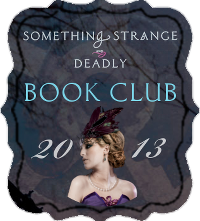 It’s the third week in Susan Dennard’s online book club for Something Strange & Deadly. You can see all the great things she’s been sharing, including her star casting of her books and historical information about what was happening when Eleanor and her crew were fighting zombies. It’s a lot of fun and if you haven’t read this series, you need to get on it. This is great zombie fun! Eleanor finds herself more and more intrigued by (perhaps even attracted to) Daniel Sheridan, the inventor of the Spirit-Hunters. What is it about him that appeals to her? And vice versa, what do you think attracts Daniel to Eleanor? Then there’s Clarence Wilcox, the seemingly perfect eligible bachelor. Why do you think Eleanor doesn’t like Clarence? I love the initial love/hate relationship between Eleanor and Daniel. I think she is initially attracted to him because he doesn’t treat her as though she’s a fragile thing despite referring to her as “Empress”. He is highly intelligent and challenges her in no way anyone ever has before. Meanwhile I think Daniel is attracted to Eleanor because she’s so strong-willed and different from most of the flighty high-class Victorian girls who probably wouldn’t give him the time of day. They are both very different from the stereotypes they fit in at first look and I think that attracts them to each other from the beginning. As for Clarence, it feels much like an obligatory relationship than one built on chemistry. I liked that Clarence was a pretty nice guy despite his own history of not-so-niceness, but he still fell into the habits and social norms of the age. Eleanor wasn’t challenged by Clarence and he didn’t respect her strength of character and intelligence. He was almost the polar opposite to Daniel, who is attracted to Eleanor because of how different she is from her peers. In 1876, Paris was really the most glamorous city on earth. The City of Light with its electric street lamps, it's uniform (and gorgeous) beige buildings and slate rooftops, the museums and gardens--to say nothing of all the beautiful people and clothes. It's no wonder the Spirit-Hunters find themselves distracted from the Dead by luncheons and salons, new clothes and new equipment. Do you think, if you were in their shoes, you might also be easily distracted by all the wonders Paris holds? Or would you be better able to force it all aside and focus on the rising problem of les Morts? I would get distracted by the pastries. I would just sit in a café and gorge on pastries, completely forgetting about the wandering dead. I would hope that I would eventually fall out of my pastry coma and deal with the zombies, but I don’t think the luncheons, salons and society events that distract the Spirit Hunters would keep me away from fighting zombies. Then again I’m not very social. I don’t think Paris would change that. Instead I would get distracted by food and art and the wonders of Paris. If you're participating in the Something Strange & Deadly book club, link up your responses to this week's questions in the comments below.